This week MOTIONrehab® client Jason Liversidge was featured on BBC Breakfast. 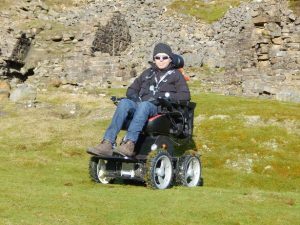 Jason has Motor Neurone Disease (MND) and is wheel-chair bound but this does not stop him tackling mountains and other challenges! With the help of his all-terrain 4×4 wheelchair, Jason climbed the highest mountain in Wales, Mount Snowdon, this week. Jason took on the challenge in a bid to raise £5,000 for Marie Curie Nurses and the Dove House Hospice, Hull. After being diagnosed with the muscle-wasting disease in 2013, Jason from Rise, near Skirlaugh, has lost the ability to move but the self-confessed adrenaline junkie has not let his condition get in the way of his passion for excitement. He has also taken on the longest zip line in Europe at speeds in excess of 100mph, parasailed in Turkey and driven at Silverstone in a Formula One-style racing car. He is now hoping to raise money for the organisations that he and his family depend on for everyday support – Marie Curie and the Dove House Hospice. As well as raising money and awareness Jason hopes that by achieving this, he inspires other people to do what they can to overcome their serious illnesses. Anyone can donate to Jason’s challenge by visiting his gofundme page at www.gofundme.com/Mount-Snowdon-in-a-wheelchair or visit his website at http://www.makingmemories.life for updates.